CUPERTINO, Calif.—At WWDC, Apple showed off features and cool tricks coming to iPhone and iPad in iOS 11. At today’s event on its new campus, the company announced iOS 11 will be out of beta and available to the public on September 19.
iOS 11 won’t fundamentally change the look and feel of your iPhone, but it does offer some exciting updates. One of the most useful new features is the Files app, which organizes all of the files on your iPhone as well as files stored in other locations such as iCloud and Dropbox. It almost mimics the Finder window on macOS, and that offers a convenient new way to store, organize, and access all the information on your handset. Developers have access to the Files app, too, so individual apps will show up in the Files app as their own folders, making it easier to move documents in between programs. The Control Center also has a new look in iOS 11 with new bubble-like icons that you can move around and customize. Much like you can do with Widgets, you’ll be able to choose the tools you want to have in the Control Center. Since the Control Center can take up the entire display, you’re not as restricted in the number of tools you include either. Many features will be accessible via 3D Touch in the Control Center as well. Other new features in iOS 11 include Apple Pay integration in iMessage, a new Siri voice and interface that gives you the option of typing into the virtual assistant instead of only speaking, and a redesigned App Store with separated Games and Apps sections. Maps also has a “Do Not Disturb While Driving” mode that will disable all notifications when it senses you’re in the car. iPads haven’t gotten as much love as iPhones from software updates in recent memory, but iOS 11 changes that. The Dock on the iPad is now persistent in that you’ll always be able to access it even when you’re in another app. Swiping up from the bottom of the display brings up the Dock, and from there you can open another app and have multiple apps open in Split View. 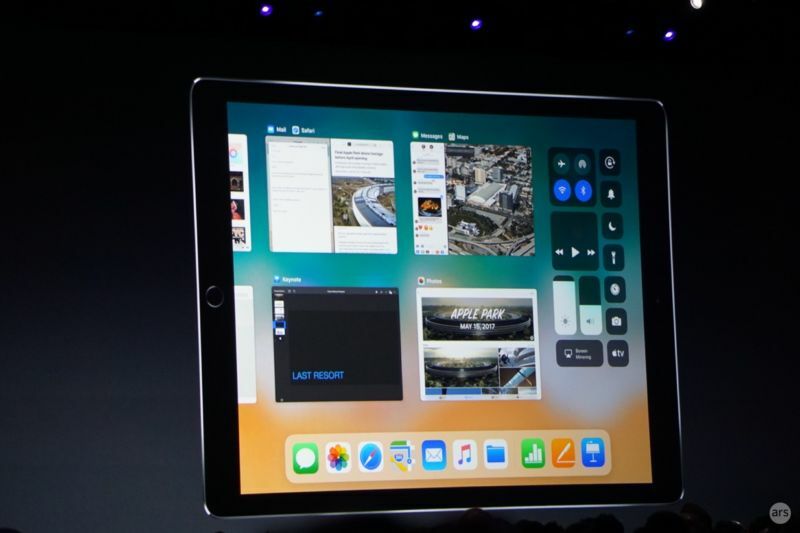 The revamped App Switcher is accompanied by the new Control Center, so you can access both at the same time. The App Switcher will also remember your favorite Split View app combinations, so you can pick up where you left off using multiple apps at once without opening each up individually. The Apple Pencil also gains wider support in iOS 11, as well as some new tricks. Instant Markup lets you take a screenshot and annotate it with the Pencil, and a “Mark Through PDF” option lets you convert any screen to a PDF file that you can write on. Inline drawing is another new feature that lets Apple Pencil users tap anywhere in a note or email and handwrite a message. Any typed text will automatically format around the handwritten section, making it easier to combine type and scribbles in one message. It’s always exciting to get a feel for the new features brought by a software update, but I anticipate the most excitement will be for iPad Pro users. The new features introduced in iOS 11 turn the slab from a simple tablet into a possible laptop replacement and certainly a competitor in the convertible and detachable markets.